This year was my first time to experience the Houston Nutcracker Market in Reliant Center. If you've ever been to a Home & Garden convention, this was much like that. I was in Heaven! In other news, my mums survived! It's a miracle I tell you. Everything I plant usually dies within weeks of me planting it. We had a nice weekend of shopping and spending time with friends. Even though KSU didn't due so hot against MU. :( There's always next weekend! I was wondering if that was any good! Wish I would've gone dangit!! Did you go to the Christmas Market at Second Baptist? It was pretty good! Not near as big as that one but still some cute stuff!! How fun! I wish we had something like that here! Sounds like you had a good weekend! 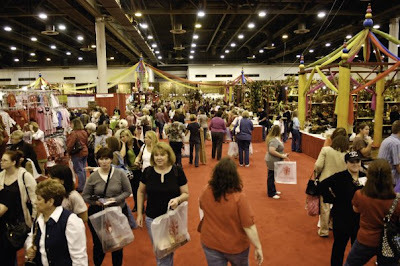 I have never been to the Houston Nutcracker Market before...but I might have to go! Love your mums..they have are beautiful!! I've read your blog for a long time & always wonder where in houston yall live. We're out in Crosby! I want to go to a christmas market...ill have to check for some around here. I kept wanting to know how that was every time I would hear about it on the radio. We will have to go next year because it looks like a blast!!!! I am so mad that I didn't go to this Nutcracker market. It looks awesome! So bummed!! Your mums look great, so perty! I LOVE the Nutcracker Market! It always gets me in the mood for Christmas. I am taking a half day tomorrow and going to "A Christmas Affair" which is the JL Christmas Market here in Austin. Can't wait! Glad you had fun...and your mums look great! Sounds like the KC Junior League. Did you ever go with your mom? She works with my sister, Gretchen. Your mums look so good! Mine are a lovely brown color :( Oh well! I had some mums and they didn't last very long. One of them was picked on everyday by Carson so that didn't help. He was always sayng pretty flower and picking them to give me. So how could I have been mad at that? That marketplace looks really cool. Back in Overland Park they have a KC merchant that looks like that. It is open to business owners only and have everything you can imagine. I usually go there every Jan to replenish on jewerly for the day spa that we own.